The Wx Forecast discussion from NOAA for our area is looking promising. more snow is coming! FRONT WILL EXIT TO THE EAST ON FRIDAY...BUT SNOW SHOWERS WILL PERSIST AS THE UPPER LOW DIGS OVER IDAHO. CENTRAL IDAHO MOUNTAINS LOOK TO RECEIVE THE BRUNT OF THE SNOWFALL. UPDATED SNOWFALL FORECAST /STORM TOTAL/ PUTS 5 TO 8 INCHES OF NEW SNOW IN THOSE MOUNTAIN VALLEYS...AND UPWARDS OF 18 INCHES ON HIGHEST MOUNTAIN PEAKS. BC Skiing this upcoming Saturday promises to be good at places where a base has been building due to last weekend precipitation event. Notice that in the chart above, the West Central and Boise Mountains have a 50-60% chance of more than 30 cm of NEW snow. NEW batteries for transceiver, and headlamp in you pack. Better, practice with your transceiver this week. No need to bury it, have a friend/wife hang it indoors above sight line and look down during the search. Inspect your aluminum shovel with extendable handle. Al shovels tend to develop stress crack, replace if you detect any. If you have a plastic/lexan shovel use it for dog poop or other tasks - then BUY a new shovel. Check your 3 meter avi probe. If you have anything shorter, help local businesses and BUY a new probe! Make the habit of checking Wx and AVI forecasts, links are provided on this BLOG! Check your 1st aid kit and Emergency gear such as fire starting material, bivy sack, puffy coat, extra gloves, energy bars, leather-man tool. Take a close look at he bindings condition ... you don not want to have a failure while touring. Get a SWAG Blue Book or journal for Wx/Avi obs. Start this weekend by looking at the snowpack and recording observations. Verify that your INCLINOMETER is in your ski pants or coat! If you do not have one - BUY ONE PRONTO! Print topo map of area to you plan to tour this weekend, study it, think where you want to go, and stash it in your coat. If you are feeling nerdy, study benefits of UTM coordinates. As some of you know, the avalanche danger early in the season is accentuated due to the shallow snowpack and formation of basal facets (depth hoar) at the bottom of the snowpack. In addition there has been a lot of wind transport and windslab formation during the last weekend two storms. This upcoming Thursday/Friday snow loading event will surely stress the snowpack! This is a good time to visit those low angles slopes we always wanted to explore, and/or time to go on outing to verify overall equipment performance - check skins, new boots, backpack, ... TAKE it EASY! 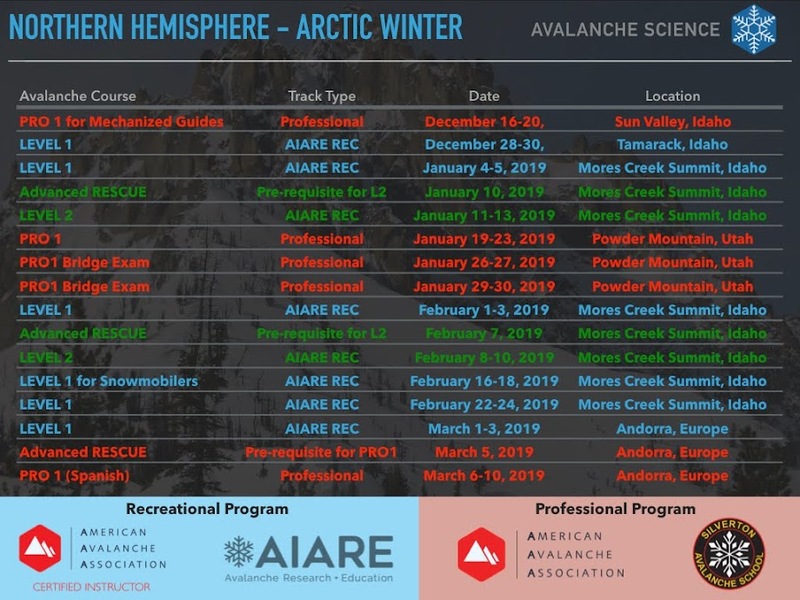 This Saturday - November 19th, there is a NSP instructor Conference organized by the South Western Idaho and Eastern Oregon Region NSP Avalanche Education Team. The event is at the Best Western in McCall, and starts at 9 AM. We hope to finish by 4 PM. There will interesting talks about Snotel Tools, Winter Weather 101 workshop, Decision Making and Avalanche Fracture propagation, talks by the region Avalanche Center directors (Payette and Wallowa Avalanche Centers), and the best part; you get to meet folks interested in advancing avalanche eduction in our area.